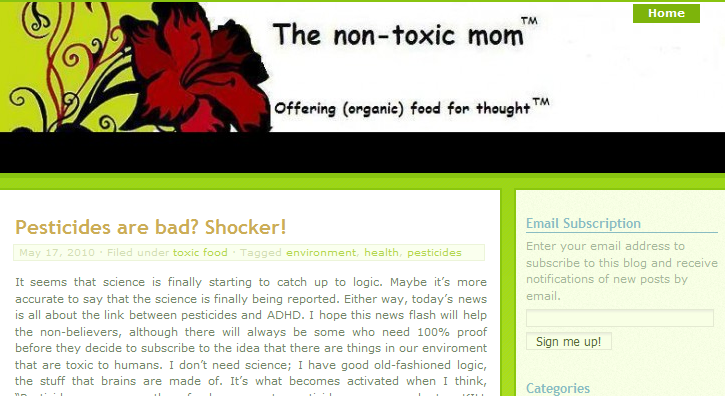 This week I interviewed Sheri from The Non Toxic Mom.com. Her blog is a helpful tool for any parent who wishes to learn how to create a chemical-free environment for their children. Scroll down for my exclusive interview with Sheri. Sheri: About 6 weeks ago. Sheri: I blog because I want to share thoughts and tips about how to raise kids non-toxic kids in our increasingly toxic world. I like to share my views in a humorous way when I can. Blogging has been a great outlet for me; it’s helped me to feel less alone. Sheri: My blog is about my efforts to keep my kids chemical free, the challenges I encounter, the defenses and explanations I constantly have to give, the frustrations I often feel, and celebrations of small achievements. HM: What are your ultimate goals for your blog? Sheri: I want to develop a fan base and connect like-minded people. Sheri: I want to increase awareness. I want people to read my blog, get a good laugh, learn something new, feel less alone, and perhaps start thinking about food, kids, and life in a new way. I’d love to inspire change. Sheri: I use lots of personal anecdotes and experiences; stuff I think people can relate to. I try to offer suggestions without preaching. I use humor when I can. Mostly, I try to make it interesting! Sheri: I’m still learning, but I would say that if you are thinking of starting a blog, and you have doubts, just GO FOR IT! It’s really fun! HM: What is one thing that I did not cover in these set of questions? Sheri: What helpful advice have I received about blogging? Linking to other blogs to increase traffic on mine.